The Tree Yellow is the only representative of the genus Gandaca in Singapore and Malaysia. It is distinctive in that the underside is completely unmarked. On the upperside, except for a narrow black marginal border on the forewing, the colour of the butterfly is a plain lemon yellow throughout. 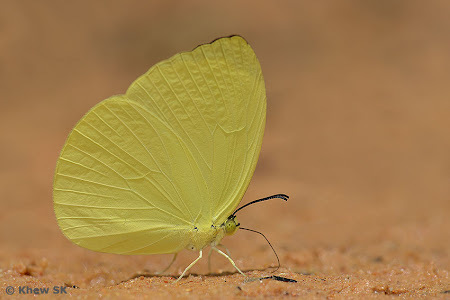 When it flight, it could sometimes be mistaken for one of the several Grass Yellow (Eurema) species, but its lighter lemon yellow and generally larger size usually distinguishes it from the others. This shot shows the Tree Yellow puddling (imbibing salts from damp sand) in the nature reserves. Although common, the species is usually associated with the forested areas in the nature reserves and is seldom seen in urban gardens and parks. At times, several individuals are observed puddling together.